Home Are you prepared for extreme winter weather? 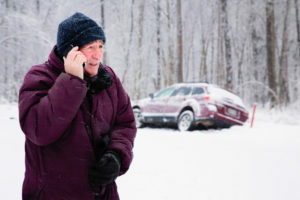 Are you prepared for extreme winter weather? It’s cold in the Midwest. We’re Minnesotans. We’re used to it. But last week tested our arctic hardiness as record low temperatures swept across the region. While warmer weather is on the horizon, this a great time to ask ourselves if we truly are ready if a winter emergency should strike. When it comes to driving in weather like this, you should make sure you have a winter survival kit at the ready. It’s also a good idea to keep the survival items inside your car, not in your trunk because if you were trapped, you would have no way to access them. Candle and matches: A great way to produce heat is with a candle inside a metal can. In cold weather, it’s typically better to use matches instead of a lighter as the butane can’t light if temps are too low. If you do run your car for warmth, only run it for 10 minutes at a time and make sure the exhaust is not blocked by ice or snow, which can create a deadly build-up of carbon monoxide. Flashlight: Whether changing a tire or taking a look under the hood, a flashlight always comes in handy. Keep spare batteries as well. Cell phone car charger: Cell phones are crucial for calling for help, but that’s only if they’re charged. Notepad and Pen/Pencil: In an emergency, you never know when you might need to write down a phone number, license plate or a driver’s license. First Aid Kit: Include gauze, Band-Aids, spare medication, and other essentials. 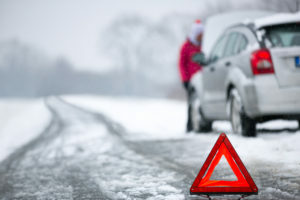 Winter gear: Staying warm is your number-one priority if you’re stranded and waiting for help. Keep an extra hat, gloves/mittens, and boots in case you need to get out of your car. Blanket: When paired with your winter gear, a blanket can keep you warm until help arrives. Cash: Not everyone accepts cards, and you may need to pay for emergency gas or a tow. Nonperishable food: Stock up with food such as granola bars, nut butter, raisins or chocolate chips. Tire gauge: Tire problems are common in cold weather, so be sure to check your tire pressure regularly. You may also consider keeping a portable air compressor in your car for when your tires are low. Tool kit: Minor tweaks and repairs can sometimes be accomplished with tools such as a screwdriver, pliers, adjustable wrench and duct tape. Absorbent: Keep a little bag of floor sweep absorbent, kitty litter or dirt to sprinkle in front of your tires for traction if you get stuck. Reflective warning triangles: One of the biggest threats when your car breaks down is being hit by other cars. Reflective warning signs, combined with your flashers, can alert other drivers to your presence. Jumper cables: You never know if the person who comes to save you will have jumper cables, so it’s best to carry your own just in case. You could also purchase a portable power pack that can be used to jump start your vehicle. Foldable shovel: If you need to dig snow out from around your tires or clear snow from around your exhaust, a shovel does a much better job than your hands. A foldable shovel is portable and easy to store. Check and update your emergency kit every year. If you have children, be sure to pack enough in your emergency kit to accommodate everyone. Before driving, clear snow and ice from your headlights and taillights so that you will be more visible to other drivers. Be aware of the signs and symptoms of frostbite and hypothermia, as detailed by the Minnesota Department of Public Safety. In temperatures below zero, these conditions can happen in a matter of minutes if you are not careful and paying attention. 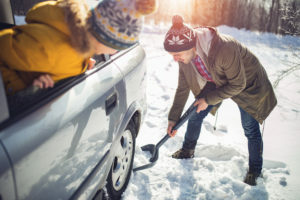 Before you head out, take a look at the Minnesota Department of Public Safety’s driving and travel checklist or winter survival tips in your car. Do you know how to prepare for severe weather? Is caffeine safe for your child?